In the 1950s, an important social experiment began that would culminate in deep cultural change for people with mental disabilities. Realizing that many people in institutional care could live in communities, states began discharging people with mental illness and with intellectual disabilities* (IDs) into communities. Despite the many benefits of this shift to community life, the high hopes that drove the movement fell short in the knowledge and understanding needed to make the effort a true success (Koyanagi, 2007). The services and support people needed to begin new lives were often insufficient, unavailable, or inaccessible. Although these individuals may need some level of support as adults, their lives follow the same ebb and flow of their neighbors’ daily routines—and therein lies the rub. The Normalization Principle, intended to expose people with disabilities to the same patterns of life that mirror the other members of the society around them, brings people with ID into contact with all aspects of a normal life, including habits and behaviors from which they were previously protected, including substance use and, inevitably, substance abuse. • onset in the developmental period, usually defined as before the age of 18. Additionally, the level of impact on a person’s ability to function independently is further identified as mild, moderate, severe, or profound. Approximately 85% of those with ID exhibit mild deficits. Many blend into their communities, perhaps appearing a bit “slow” to others and maybe needing some support but can otherwise integrate into school, family, work, and other social structures. With their integration into the community comes potential exposure to substances such as alcohol and drugs. Adults with ID are generally less likely to use substances than adults without ID. As a group, a substantial number of people with ID live with families or other caregivers who provide some degree of monitoring; therefore, the opportunities to engage freely in all adult choices can be limited by the presence of a caregiver. Nevertheless, this presence does not prohibit all opportunities. Some people with ID do use alcohol and illicit drugs, and those who do so are more likely to develop an abuse problem. In a recent study, Slayter (2010) reviewed Medicaid healthcare billing claims and concluded that 2.6% of all people with ID had a diagnosable substance abuse disorder. Other estimates using different methodologies vary widely, ranging as high as 26% (Strain, Buccino, Brooner, Schmidt, & Bigelow, 1993). When a person with ID also has a mental illness or a dual diagnosis, the estimates of co-occurring substance abuse range from 7% to 20% (Sinclair, 2004). The research in this area is sparse, but the numbers are alarming, especially compared with substance abuse in a non-ID population of adults with mental illness, where the rate estimated to be 7.6% (Substance Abuse and Mental Health Services Administration, 2008). The myth that people with ID do not drink alcohol or do drugs has been fully dispelled. People with ID who are substance abusers share some unique traits. As a group, they tend to begin drinking alcohol a couple years later than their peers without ID, and they are less likely to be Caucasian. (Slayter). They are less likely to seek help for their problem and even when they do, the resources that are helpful for the general public fall short of meeting their needs. Additionally, this group is at greater risk of complications from drinking because they tend to be prescribed medications for other conditions, such as seizures, metabolic disorders, and co-occurring mental illness that might negatively interact with alcohol and drugs. 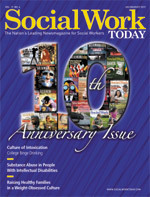 Although research in this area is lagging, clinicians are confronted with a population that is suffering the ravages of substance abuse, with a certain increase in the number of people affected as even more states close institutions and integrate residents back into society and public schools continue to send graduates into adulthood. This challenge is being accepted by a small group of clinicians. In 1991, the Dutchess County Department of Mental Hygiene in New York undertook the development of a program for people with ID and substance abuse problems. The program consists of a thorough assessment of substance use and psychiatric conditions. Therapy involves individual and group sessions and medication management, if necessary. The program is not a 12-step model, but it has supported an alternative group format, the Mansion Street Recovery Group, for people who wish to have a community of support with other recovering addicts. This group modifies the Alcoholics Anonymous (AA) concept of powerlessness over substances—a concept that is too abstract for people with ID—and instead emphasizes being capable and empowered to make changes in one’s life (Phillips, 2004). Similar work has been done in Maine where a detailed program includes assessment, treatment, and aftercare using modified materials. • Reading skills: People with ID have limited reading ability. The books, pamphlets, and signs used in AA are written at an eighth- to ninth-grade level (Sinclair, 2004), well beyond what most people with ID can read and comprehend, if they can read at all. • Cognitive skills: AA depends heavily on spiritual concepts. While having ID does not imply that a person is incapable of having spiritual beliefs, the application of these concepts to recovery is a higher-order function that is often beyond the cognitive ability of the person with ID. Analogies and metaphors, used liberally in recovery literature and discussions, can be beyond the comprehension of the person with ID. • Social and communication skills: An ID diagnosis includes deficits in adaptive behavior. One key area in which these deficits limit the success of interventions is in the person’s ability to engage in social exchanges. Limited communication skills are barriers to someone sharing his or her story and engaging in small talk, which is often the glue of relationships in their early stages. • Meeting structure and flow: AA meetings follow a common process: opening welcome, book study, step study, discussion, and sharing. The welcome may involve stating the rules of the group, including anonymity, followed by a reading from the Big Book, a study of one of the 12 steps, and then open sharing. To glean the greatest benefit from the experience, participants need to be able to maintain auditory attention on lengthy oral presentations, track the turn-taking and social conventions of group behavior, and follow the pace set by the particular group. That pace can change from week to week, depending on the participants present. Additionally, sidebar whispers, movement back and forth to get coffee, natural shuffling, and group size are distractions for people who already have limited attention spans. The focused attention and social awareness involved in this arrangement requires skills beyond the abilities of the person with ID. Relatively limited attention span and comprehension of extended oral stimuli are barriers that result in the person leaving the group or, at minimum, sitting in the session without any benefit. However, these limitations of the AA model do not need to be interpreted as absolute barriers. In the early 1990s, I cofacilitated an AA group for people with ID in a community center in Texas. While the group was relatively short lived (approximately one year in duration), participation was surprisingly consistent. Certain modifications were conducted to make the meetings more suitable for participants with ID. Interestingly, these modifications have been subsequently echoed by Sinclair (2004) as recommendations to modify the AA experience for this population. • Simplify the materials: Readings from the Big Book can be simplified into more concrete language using shorter sentences and including visual supports. A chart on an easel provides the ability to draw an idea or, with preparation, pictures from magazines and short videos can be introduced to illustrate concepts. • Repetition and checking for comprehension: After introducing a concept, it is helpful to check for comprehension. This exchange is in direct contrast with the AA flow of strict voluntary initiations of interactions, but the attention of a person with ID is greatly improved by varying stimuli and promoting exchange in which the person repeats or paraphrases what they have heard. The facilitator should remain sensitive to a participant’s desire to remain silent and such choice should be respected, with follow-up after the group to confirm that the lack of active participation is not masking lack of understanding. • Use of a teaching approach: In AA, learning occurs incidentally as members share and internalize the experiences of others, molding the new information to suit their individual styles and circumstances. This process can be too complex for most people with ID, so a group can benefit from a didactic portion of a meeting in which the facilitator specifically teaches key points of a concept from the Big Book and/or one of the 12 steps using language, materials, and role playing exercises that are at the participants’ level of comprehension. A 10-week didactic model was used by McGillicuddy and Blaine (1997) to educate people with ID and substance abuse about the dangers of cigarettes, alcohol, and illicit drugs. In this study, participants showed an immediate increase in knowledge; however, no changes were seen in substance use. Perhaps the program was too brief or perhaps additional components are needed beyond the didactic element. One point is certain: More work is needed in this area to develop empirically based interventions for a growing social problem. Working with recovering addicts is a unique experience, and it was particularly memorable for me when the addicts were adults with ID. The field of ID often requires determining how people are different from the “norm,” yet the participants in the group that I cofacilitated discussed life situations common to anyone with a substance abuse problem. With a little support, they identified circumstances and people that triggered drinking and drug use. They turned to each another for help during the week and reported at meetings how they had helped each other. And at the end of each meeting, holding hands and reciting the Serenity Prayer, they demonstrated warmth, humility, and unity that reminded me that despite different abilities, we share a common humanity. Clinicians who work with people with ID are in an exciting field marked by developments in areas that have never been addressed by clinicians in the past. Where previously these individuals lived out short lives in institutions, we are now privileged to work with people who have lived their whole lives with families and in their communities, experiencing the richness of having and making personal choices. With this freedom come the consequences of some of those choices, including the reality of substance abuse. As clinicians, we are called to acknowledge and learn about substance abuse in people with ID and to work diligently to develop appropriate interventions in this challenging new arena. *The term “intellectual disability” was recently adopted through federal legislation (Rosa’s Law) to replace mental retardation. — Maria Quintero, PhD, is assistant deputy director of the intellectual and developmental disability services division of MHMRA of Harris County, TX. McGillicuddy, N. B., & Blaine, H. T. (1999). Substance use in individuals with mental retardation. Addictive Behavior, 24(6), 869-878. Slayter, E. M. (2010). Demographic and clinical characteristics of people with intellectual disabilities with and without substance abuse disorders in a Medicaid population. Intellectual and Developmental Disabilities, 48(6), 417-431. Strain, E., Buccino, D., Brooner, R., Schmidt, C., & Bigelow, G. (1993). The triply diagnosed: Patients with major mental illness, cognitive impairment, and substance abuse. Journal of Nervous and Mental Disease, 181(9), 585-587. Substance Abuse and Mental Health Services Administration Office of Applied Studies. (2008). Results from the 2007 National Survey on Drug Use and Health: National Findings (NSDUH Series H-34, DHHS Publication No. SMA 08-4343). Rockville, MD.